Robot Wars (1993) is set in the not-as-distant-as-it-once-was future of 2041, the United States is now known as the North Hemi, where in 1993 large areas of the country were decimated by an some sort of toxic gas event... and that's about all the backstory we get. One of the other super-powers of this post-apocalyptic world is the Eastern Alliance, represented by Gen.Wa-Lee (Danny Kamekona, Robot Jox)and his assistant Chou_Sing (Yuji Okumoto), both of whom have arrived in the North Hemi to do business with corporate greed-monger Rooney (Peter Haskell, Child's Play 2), the boss at a tour/tech company that runs tour groups to a 20th century ghost town, Crystal Vista, located out in the wastelands. The tour groups are transported through the desert via a giant robot called the MRAS-2 - a giant mecha-robot in the shape of a scorpion, which looks way cool. This is the last of a series of giant robots that were once utilized in times of war, the MRAS-2 is piloted by the sexist 80's ma-cheese-mo of Drake (Don Michael Paul, Rolling Vengeance) and his wise-cracking copilot Stumpy (James Staley). The Eastern Alliance dignitary has arrived in hopes of purchasing mini unarmed versions of the mecha-technology for use in the Eastern Alliance territories. During a tour trip to the Crystal Vista ghost town the MRAS-2 comes under attack by a group of wasteland raiders known as the "centros", who attack the giant robot with a laser canon. Drake blows up the weapon with the MRAS-2's own laser defense system, afterwards warning his boss Rooney against further tours, worried there could be casualties next time. Despite showing his boss tangential evidence that the Eastern Alliance may be aligned with the rebel centros the tours continue, upsetting Drake, who refuses to run tours, instead going into the wasteland on a reconnaissance mission, once again finding evidence of collusion between the raiders and the EA, but again Rooney refuses to acknowledge the threat for fear of losing funding for his mech-program, but of course there's collusion and the inevitable double-cross happens. Slice of horror-hotness Barbara Crampton (Re-Animator) shows up as a scientist named Leda who joins one of the tours, believing that the company is hiding something beneath the Crystal Vista ghost town. She plays a battle-of-the-sexes love interest for mecha-pilot Drake, but it's probably one of my least favorite of her roles honestly, it's very bare with no meat to it, she's just arm candy for the most part, but still a cutie. Also showing up is a reporter played by Lisa Rinna, another 90's cutie who went onto appear in TV's Melrose Place and a few even less interesting roles before becoming one of the bitchy, leathery-nags on The Real Housewives of Beverly Hills. The film absolutely delivers on what the artwork promises, which is not always something you can say about a Full Moon movie to be honest, but you definitely get two giant robots battling each other in the final ten-minute stretch, but the first 61-minutes are a bit hit and miss, but if you're a vintage Full Moon junkie and you love David Allen's stop-motion artistry there's a lot here to enjoy, plus you get Barbara Crampton! Audio/Video: Robot Wars (1993) debuts on Blu-ray from Full Moon in 1080p HD framed in 1.85:1, a new HD transfer derived from the original 35mm negative. Film grain looks natural and is nicely managed, there is some dirt and debris throughout, but overall this is very clean looking, with only minor instances of white speckling and visible dirt showing up occasionally, more prominently in the optical shots. David Arkenstone's score some nice buoyancy in the surrounds, no subtitles are offered on the disc. Onto the extras we get a brand new feature with Charles Band, "The Wizard if Wars: Remembering David Allen" which runs just over eleven-minutes, with the Full Moon impresario fondly remembering his collaborations with his friend David Allen who first worked on Band's Laserblast (1978), recalling his fastidious nature, suggesting the stop-motion animator might have actually thought one frame at a time, that he was so very meticulous. We also get a vintage 28-minute Videozone featurette, Band opens it up with some cool teaser artwork for the then upcoming Puppet Master IV entry, and then into the program proper with some cool behind-the-scenes and interviews with director Albert Bands, and the cast including Barbara Crampton, Don Michael Paul, Lisa Rinna, Sanny Kamekone, Yuji Okumoto, and James Staley. There's even a bit with the stop-motion special effects team of David Allen an Jim Danforth, plus optical editor Linda Linda Obalil gives a tour of the optical printer explaining how it works. The Videozone also has an interview with composer Richard Band in the studio while he works out the score for Doctor Mordred (1992), working out some musical ideas on the piano before going into the studio and laying basic tracks on a synth, recording it on a computer and playing back the semi-finished score to a scene from the film, it's actually a pretty cool piece, The Videozone is a finished up with a series of upcoming Full Moon trailers and finished up with actress Charlie Spradling (Puppet Master II) giving us a brief tour of music/video shops around L.A. and pointing out where you can buy a lot of Full Moon merch. Also on the disc is a five-minute Full Moon promotional video and some Full Moon Trailers. The release comes housed in a standard Blu-ray keepcase with a one-sided sleeve of artwork. The disc itself features an oddly-tinted excerpt of the same work, odd in that the red-purple tinting obscures the artwork. At just barely 71-minutes long (with extensive credit sequences) the movie is hella-short but still manages to be hampered by some obvious filler that drags it down to a crawl in spots, this despite the fact that we have some awesome David Allen (Dolls) stop-motion animation. The robot miniatures are loads of retro fun, the artistry of Allen is undeniable and his special effects are absolutely the highlight of the film. The story itself is a bit uninspired, though it is competently directed by Albert Band, however, the best visuals come from David Allen's stop-motion work, not from Band or his cinematographer. 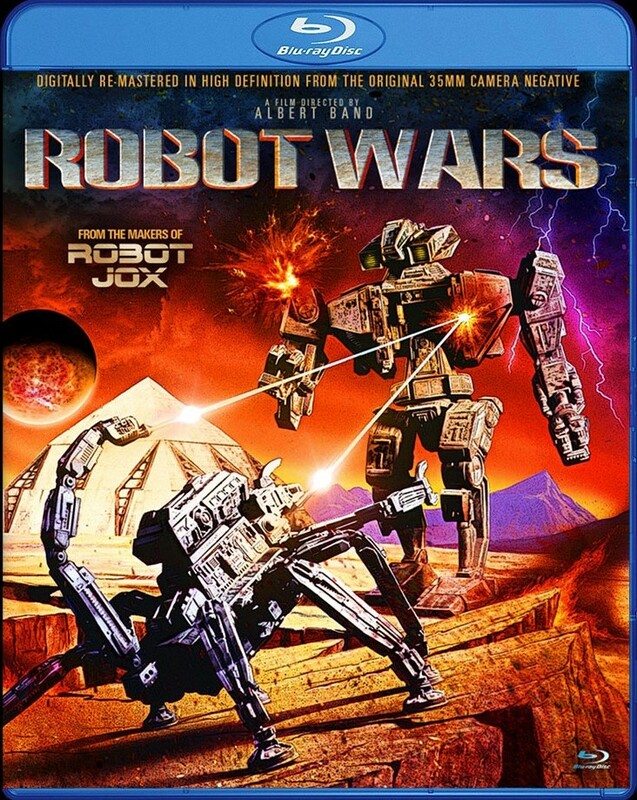 It lacks the energy and visual design of Stuart Gordon's Robot Jox (1990), but it's a fun enough spectacle for a Friday night watch, I still have fun with this movie, and if you're a vintage Full Moon/Empire junkie like myself I know you are hoping that we get the other Full Moon giant robot movie on Blu-ray this year, that being Crash and Burn (1990) directed by Charles Band - c'mon FM, make it happen!